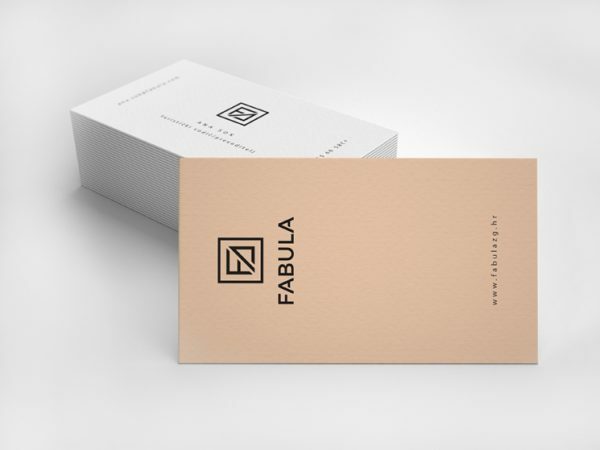 Hana Pečur made these business cards for Fabula, a small company from Zagreb that provides tourist guide services, translation and interpreting services. The word ‘Fabula’ in Croatian means ‘story’ and her client decided to choose that name because it sums up everything that they do in one word. When it comes to logo, the idea was to create a minimalist logo with just a bit of feminine touch, which could be used for both services offered by Fabula – translation and city tour services – while not being specifically connected to one of them. Therefore, the logo consists of the first (F) and the last letter (A) of the word ‘fabula’, and that way it also symbolizes the beginning and the end of the story. The business cards were printed full color double sided on 300 gsm paper by Spektar, a print & copy studio in Zagreb center.